Today please welcome Carrie Bailey AKA PeevishPenman, to talk about her experiences in publishing her first novel. She an author and fellow Star Trek fan so she will fit right in here. I’m going to share my experience publishing my first novel without hiring an editor, but first, a confession. Star Trek. I love it. 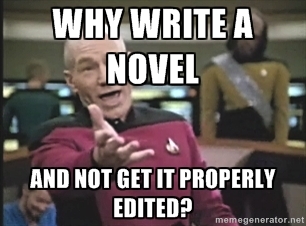 I bet in the Star Trek universe computers proofread novels in less than five minutes and since they don’t use money anymore, people write for the sake of art, entertainment and self-expression alone. It’s a world where I would love to be an author. I remember watching how, in the later series, major characters became journalists and holonovel writers. They didn’t consider indie versus traditional publishing. They just wrote. Gave it to the right person. And then dealt with the legal or emotional aspects of being successful career writers. Maybe I was watching too much Netflix when I finished my first science fiction novel, but I jumped to warp speed to get it published, blasting through the final stages of its development. At the time, I thought I had good reasons. Just after keying “the end,” metaphorically speaking, I asked around on Twitter for beta readers and emailed 8 copies to the 4 women and 4 men who responded. I made the cover while I waited. 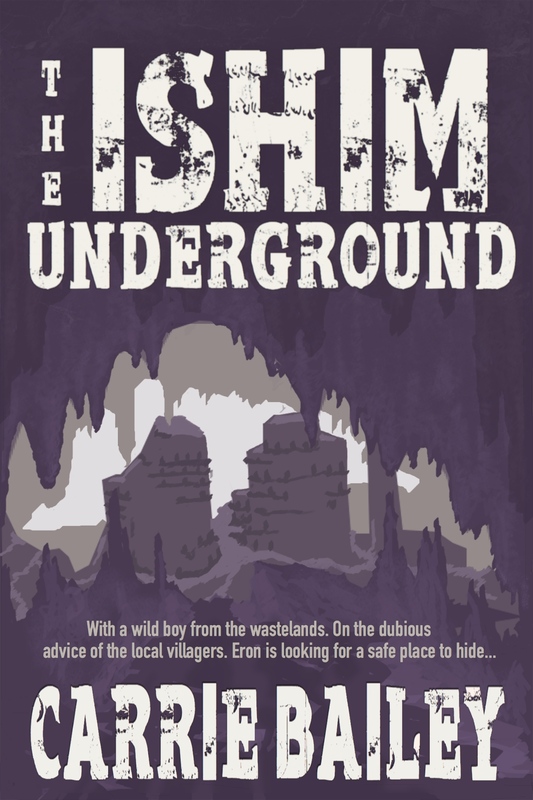 Then, when I got feedback on the cover, I waited some more for the beta readers. By the end of the month, five of the beta readers sent me their feedback, which was both positive and encouraging. So, I did a quick pass over the manuscript to correct the spelling and started formatting the ebook. Bracing myself mentally to cope with possibility of humiliating failure, I uploaded it to Smashwords and Amazon within a week. It’s true. I spent five years creating the world for the novel and its characters and their cultures. Pages of notes outline their histories, their laws and their traditions. Why did I not invest in an editor? I have excuses. My older sister had always proofread my work, but we had falling out some months before I finished my book and part of me didn’t want anyone else to take on that role in the writing process. And I couldn’t do it myself. And I couldn’t afford to pay someone else. And no one would really mind, right? Readers mind bad proofreading, even beta readers. Two of the beta readers came to me after I published the book afraid I might end our friendship when I heard what they had to say. I’d given them copies with no edits and explained so at the time, but for them, the spelling errors had been so distracting, they couldn’t get very far. While the final copy of the book has less of those issues, I’ve had other people comment to me that it felt like reading an excellent draft. The most common reviews are a similar combination of delight and disappointment. They loved the book. They want to read more in the series, but they want to know why didn’t I take the time to get it edited properly when everything else was done so well. After some time and a lot of consideration, I know the real answer. I wanted something to blame if readers didn’t like it. I’m often mystified by writers who publish their books with poor cover art, but in my own way, I am guilty of sabotaging myself in much the same way as someone who slaps text on grainy photo of a distant sunset. Of course, as an artist, I found it easy to make a passable cover for my own book. So, I’m not in that camp of sad writers. But, I’ve never been a perfectionist and spelling, specifically, is one of my weaknesses. I’m in that camp. Also, I like to start sentences with conjunctions just to rebel against our arbitrary conventions. But, there is a HUGE difference between consistent style choices and errors in the text. In not collaborating with a second and more professional set of eyes, I produced a good novel with some faults that detract from the reader’s enjoyment. And I did it, because I wanted to safeguard myself from the harsh criticism that professionals endure. I didn’t want to look too professional. I wanted to look amateur so that more of my shortcomings might be overlooked. People can be very generous with amateurs in a way they won’t be with professionals. I was a being a coward. Although in the world of Star Trek, writers can follow a straight line from inspiration to finished product, real writers confront less glamorous, more personal barriers to being successful. I believe at some point during our development every writer will engage in some random self-sabotaging behavior and make pitiful excuses for doing so that only they will believe. And when we find ourselves in that position and recognize the problem for what it is, we need the courage to seek help or advice. We need beta readers. We need editors. We need cover artists. We need people who can do print and digital formatting well. Some of us may dabble in a little of everything, but most of us will have to collaborate with other people, because they have skills we lack. Even when money is an issue, we can still usually find someone willing to trade a service we do better for a service they do better. Readers always deserve the best possible experience we can offer them as writers without exception and without excuses. 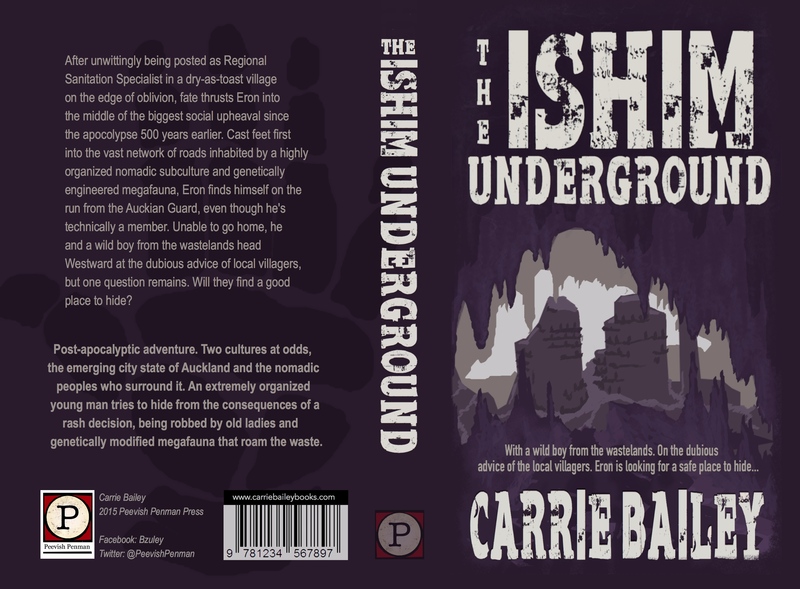 Carrie Bailey @PeevishPenman is the author of The Ishim Underground, a New Zealand post-apocalyptic adventure. She is an active coffee drinker and conversationalist who enjoys painting, staging one woman invasions of random countries and writing her author bio in third person.